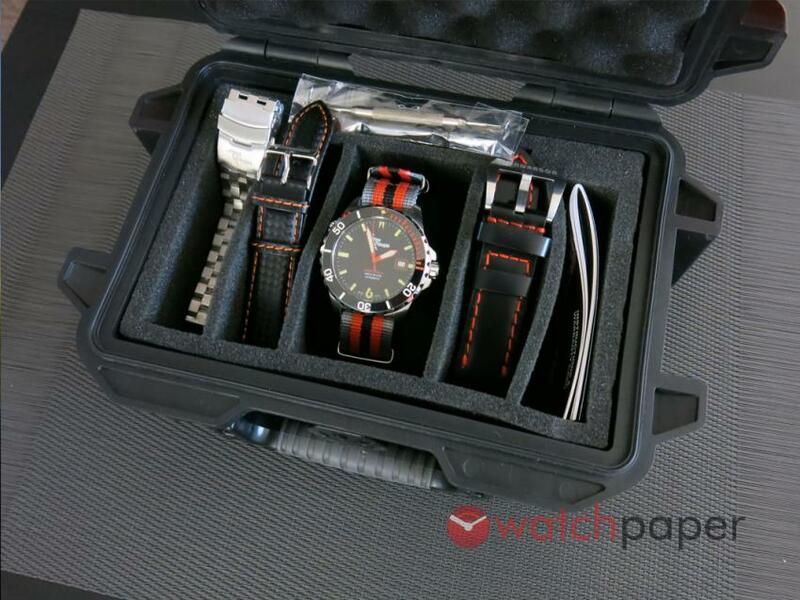 Without opening the hard case that holds the watch, I could immediately tell that we are far from the luxury territory. An impression that was reinforced once I opened it. This packaging is not about elegance, but a demonstration of pragmatism, the look takes the backseat and the focus is on the protection of the watch. 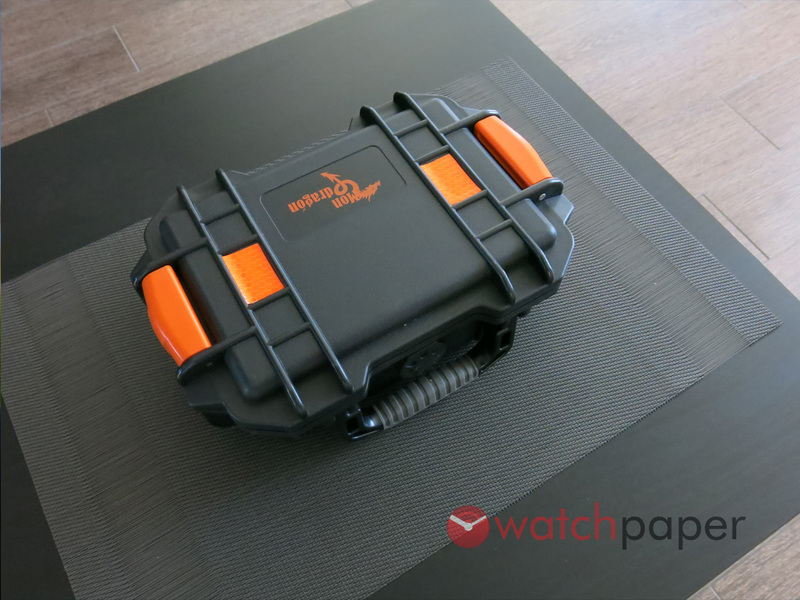 With the three straps, a bracelet and a strap changing tool, it gives the impression of a well-supplied toolbox. Every buckle and clasp is branded with the Mondragon logo, I have to compliment their attention to these small details. There is also a small booklet that presents the brand, the specs, the Angel Falls, plus the maintenance and warranty information. Again, design-wise it leaves room for improvement, but it serves very well its purpose. 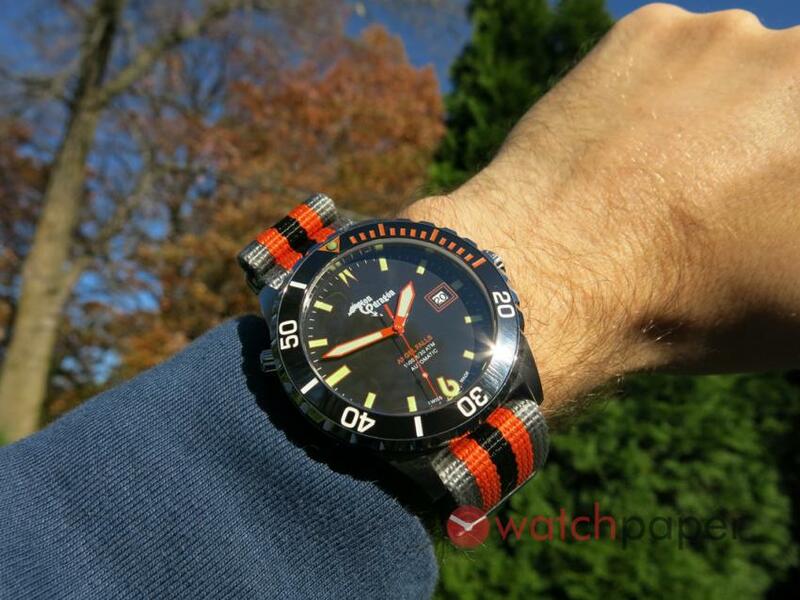 Lately, I was reviewing mainly dressier watches and when I strapped on the Mondragon, I was sort of surprised by its weight, even on the NATO strap. 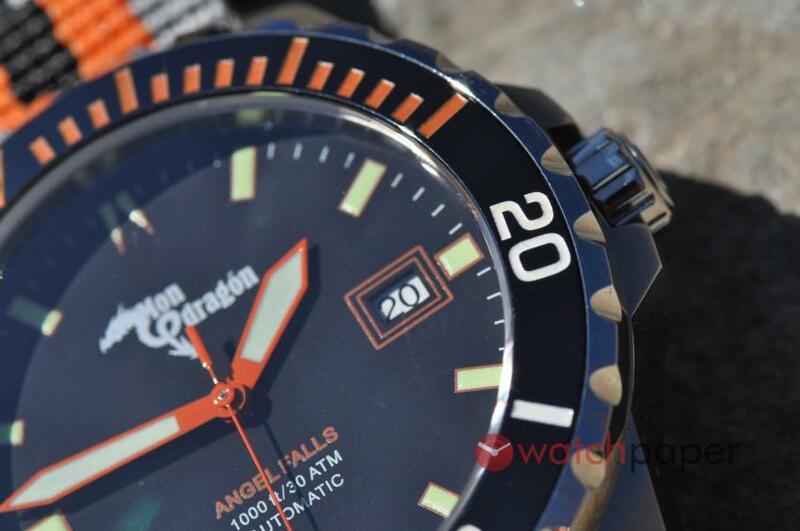 Of course, it’s a 43 mm stainless steel diver watch with a water resistance of 30 ATM! The side of the case has a vertical brushed finish that creates a cool contrast with the polished bezel. The screw-down crown at 3 o’clock is protected by angular crown guards, while at 10 there is a helium release valve. 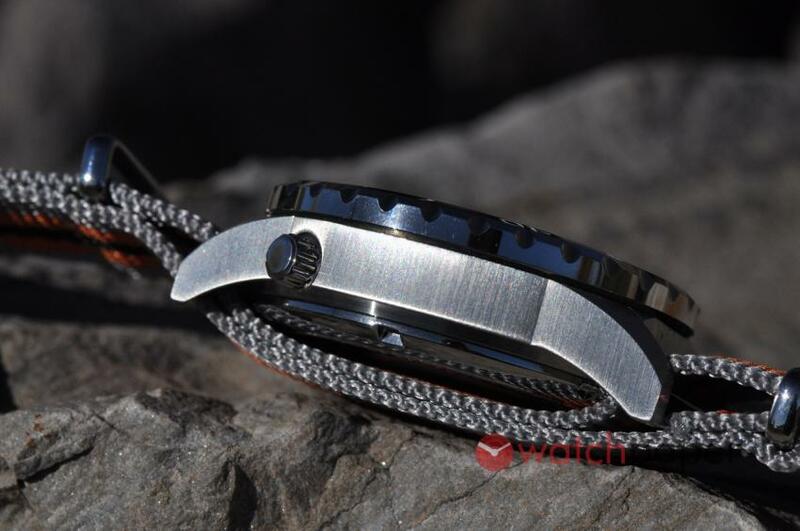 The crown is big enough to offer a good grip, winding and adjusting the time was smooth. As I mentioned earlier, the 120-click unidirectional rotating bezel is polished, a finish that works nicely with the glossy ceramic insert. When it comes to bezels, ceramic is a well-respected material for its scratch-resistant properties. 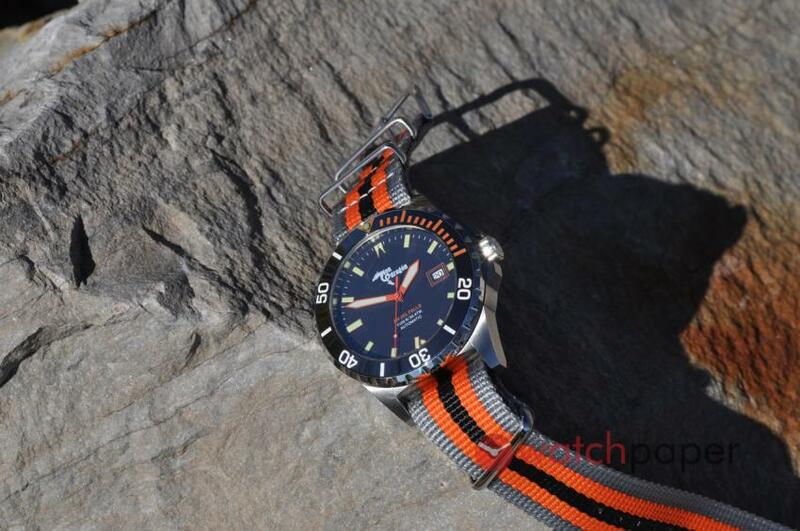 As with typical diver bezels, between 12 and 3, the minutes are marked with a different colour — orange in this case. Rotating the bezel feels a bit wobbly, at this price it should not be a deal breaker, but it’s not my favourite feature of this watch. 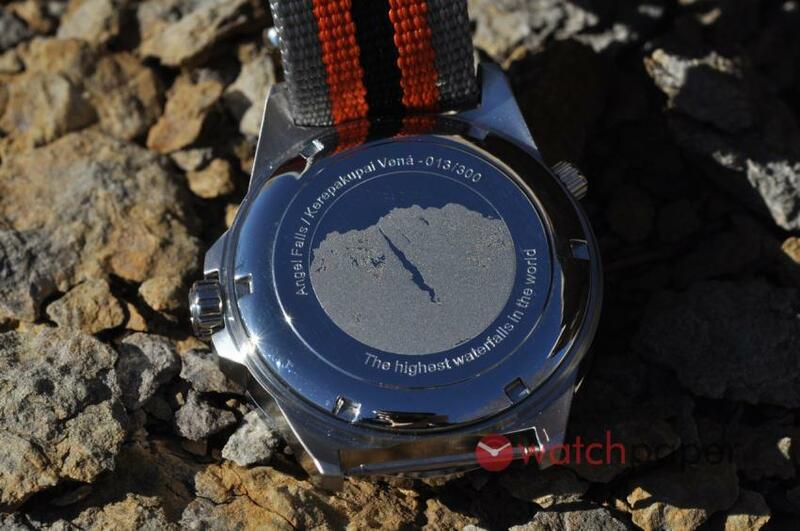 The solid screw-down back of the watch is decorated with an image of Angel Falls, which is the highest waterfalls in the world. Under the hood, Mondragon is offering to automatic movement options, either the Swiss ETA 2824-2 or you could save some money by going with the Seiko NH35A. A matt black dial has no texture and very few decorative elements, everything has a purpose. The thick batton five-minute markers have an orange border and are filled with C3 Super-LumiNova, the only numeral is the bold 6 at the bottom. The orange hour and minute hands are diamond-shaped and have a generous layer of Super-LumiNova, while the thin second hand has a little lume-filled disk. 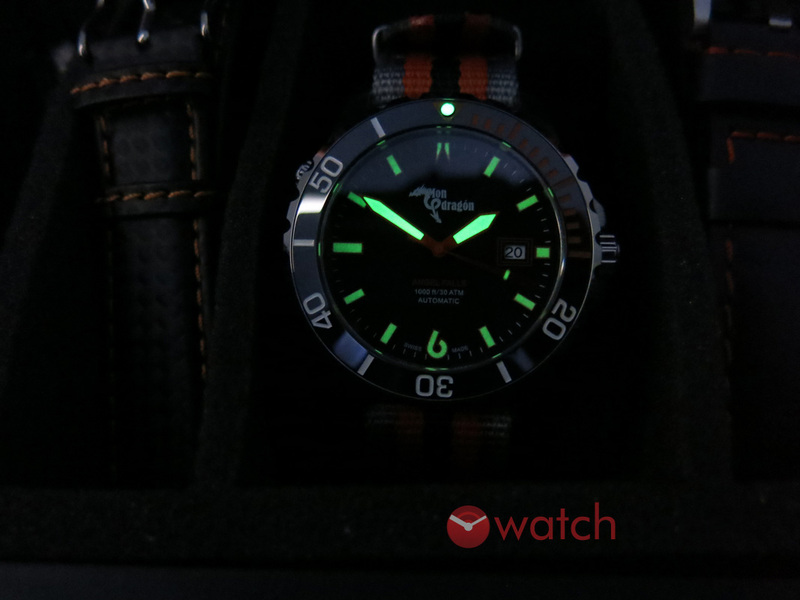 In the darkroom, the lume-filled dot on the bezel and the hands outshine the indexes of the dial. They are very bight, among the best I’ve handled, which is a praiseworthy achievement on a dive watch coming from a new microbrand. 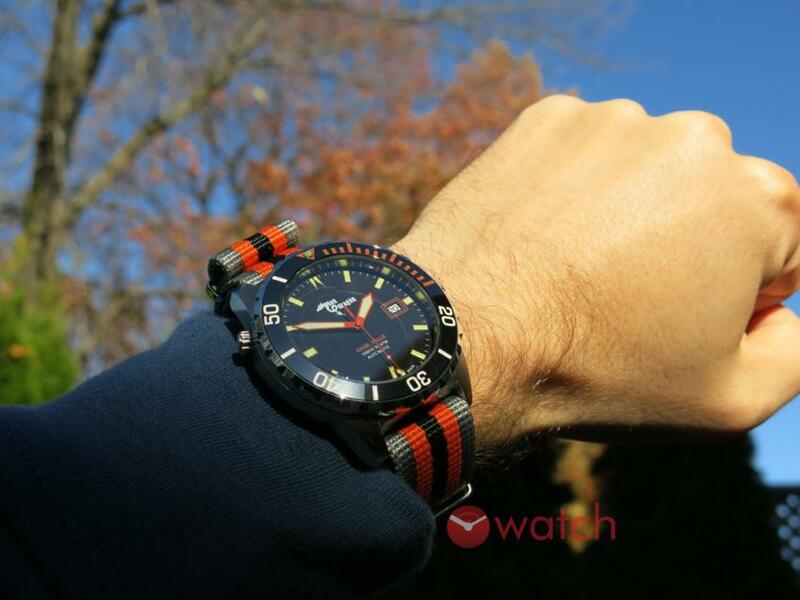 While the watch came with all these straps and a bracelet, I was wearing it on the NATO strap. When it comes to looks, a bracelet or a leather strap is more elegant, but to me, nothing beats the comfort of a NATO strap. In this case, I found that the grey-orange-black NATO complemented nicely the overall colour-scheme of the watch. On the wrist, it gives the feeling of wearing a solid tool watch. 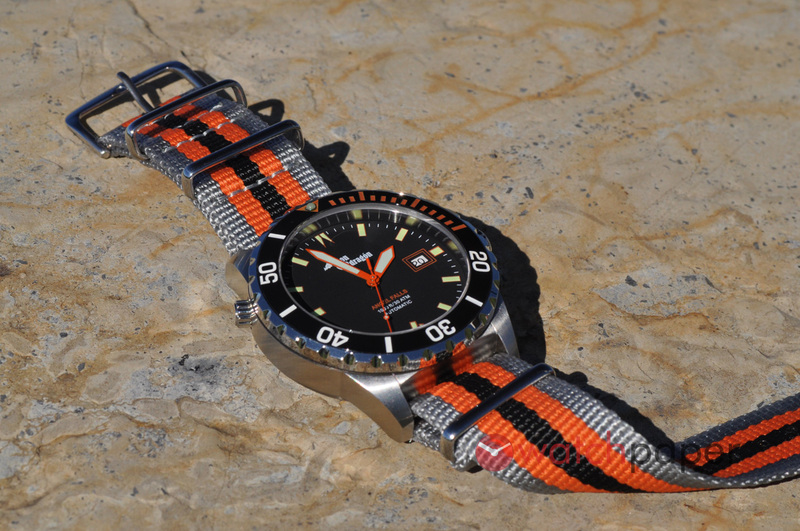 You can dress it up with the bracelet, or that beautiful carbon fibre-pattern strap with orange stitches will bring out the beauty of this watch, and for a casual occasion, you can always go with the NATO strap. It is the ideal watch for a vacation on a beach. You can just go with this Mondragon, you won’t have to bring the hard case, just bring all the straps along to diversify the experience of wearing it. 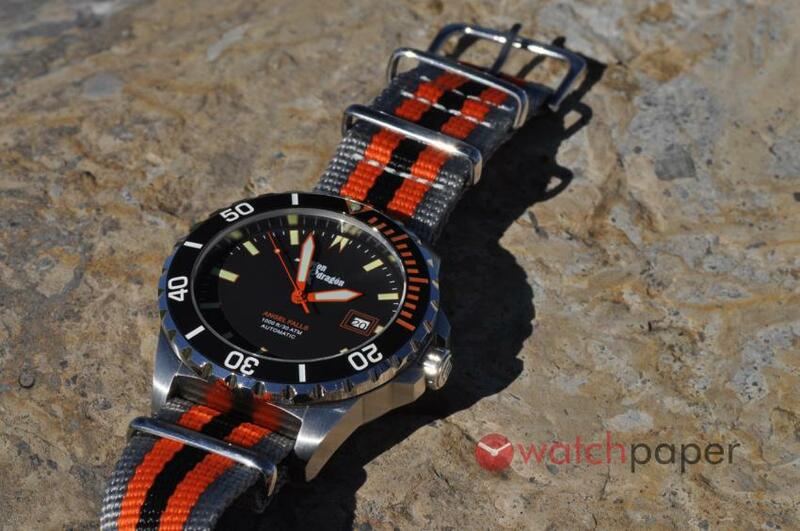 You can go in the ocean, go out during the night, you are covered for every occasion with a good-looking diver. The prices on Kickstarter offer an incredible value! As I’m writing this review, there is still a Super Early Bird available with a Seiko movement at $150, while is the Early Bird is not far at $175. If you want ETA inside, the Super Early Bird is $300, while the Early Bird is $350. November 3, 2017, will be the last day of the campaign and remember the campaign is already reached its goal, so it should be a done deal. Before you go… thanks to Igor, I can give away this Swiss Made review model. To keep things simple, we are using the best giveaway platform out there, used by many major blogs and websites, called Rafflecopter. To enter, all you have to do is click the “Visit WatchPaper on Facebook” link in the Rafflecopter box, before November 4, 2017.